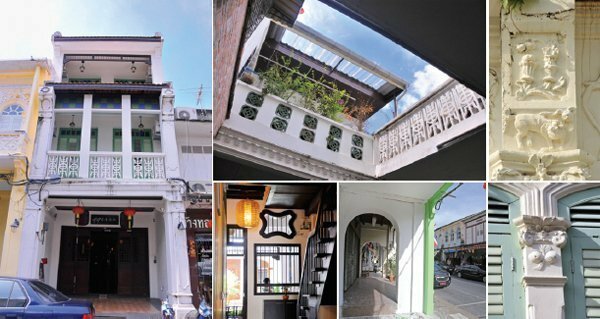 The classic Western architecture you can see in Phuket in the shape of old Sino-Portuguese mansions his the result of infl uences ranging from English and Dutch design schools to Chinese beliefs and pragmatism. This results in an interesting and rich blend of colonialera architecture. The Chinese infl uences are fairly obvious and are a direct result of the large infl ux of Chinese workers and labour leaders who came to cash in on the tin-mining boom of a couple of centuries ago. Most of the newcomers to the island in those days were from the south of China – Hokkien province. If you look closely at these old buildings you’ll see a fascinating mélange of spiritual belief and practicality. You’ll also see little fl ourishes above window frames of ‘Nam Tao’ patterns, fi re pearls, flowers, and reliefs of various animals. The byword in those days was ‘adaptability’ as architects melded together several different cultures and styles. A dominant feature of this architectural style is often noted at the façade of buildings in the shape of a fi ve-foot long curved indent known as a ngorkarkhee in the Greek Ionic style and you’ll also notice typical Corinthian embellishments of sculpted leaves and ‘foliage’. The island’s remaining Sino-Portuguese mansions are typical of the practice in the past of merging of Chinese practicality with Western designs. Several Chinese practices such as leaving a wide open space in the middle of the house for cooling purposes are noticeable. King Rama IV – The first period is in the beginning of King Rama IV’s reign. Construction during this time showed a strong Chinese pragmatic infl uence which often resulted in one- or two-storey buildings. King Rama IV-VI – The second period is from the end of King Rama IV’s reign until the King Rama VI period. At that time Western architecture was beginning to become popular and the façade of buildings was embellished by Greek-Roman touches such as graceful curves in windows and doors with stucco above them. King Rama VII – The third period is during the early reign of King Rama VII. Designers brought in lower façade decorations and incorporated a verandah, with lower-fl oor open spaces emphasized. King Rama VII-VIII – The last period is at the end of King Rama VII’s reign and into the reign of Rama VIII. Stucco was still incorporated, along with the Western-style use of mirrors and the use of a verandah.As for utilities, we can classify Sino-Portuguese architecture into four types: The bureaucratic office; the commercial building; the mansion, and the shrine. A typical Phuket bureaucratic office design is encapsulated in Phuket City Hall and Phuket Provincial Court. Phuket City Hall is largely similar to Phuket Provincial Court building and has the distinction of being the very fi rst reinforced-concrete building in what was then known as Siam. It was constructed in the period of King Rama IV, when the iconic and noteworthy Phra Rasdanupradit Mahisorn Bhakdi (Kosimbi Na Ranong) was governor of Phuket. 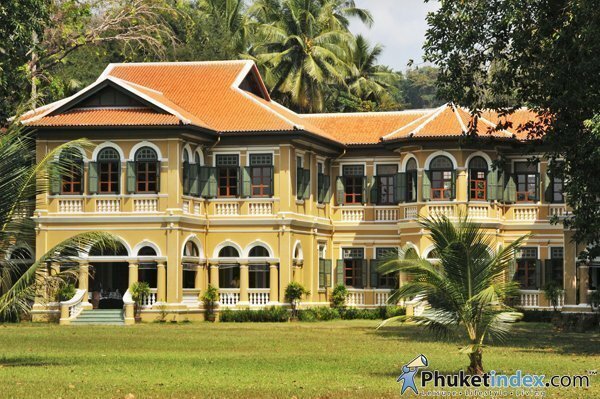 Phuket has about 10 Sino-Portuguese mansions left. These were the elegant abodes of people who’d made good on the island. Known as Ung Mor Lhao, the people who inhabited these stately buildings were more than likely millionaires. 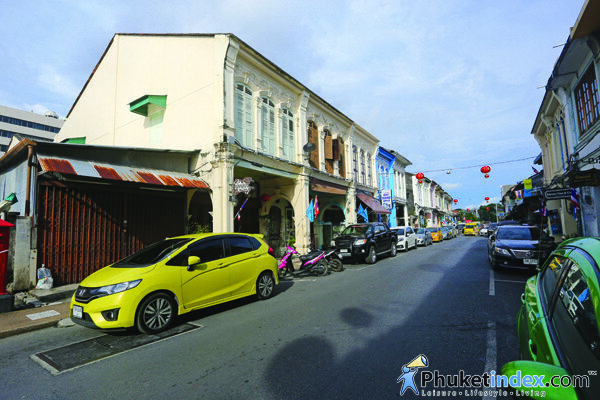 There are several gorgeous mansions in Phuket town such as the homes of Luang Anuphas Phuket Karn, Luang Amnart Nararak, Pra Aram Sakornkete, and Yusoot Sodaban. Nowadays, some mansions are for sale or are rented out to become restaurants (and cooking schools), schools, and tourist attractions that you can actually visit them. You’ll find many shrines in Phuket where the new generation pays its respects and learns ancient culture and traditions. They’re also popular tourist destinations. 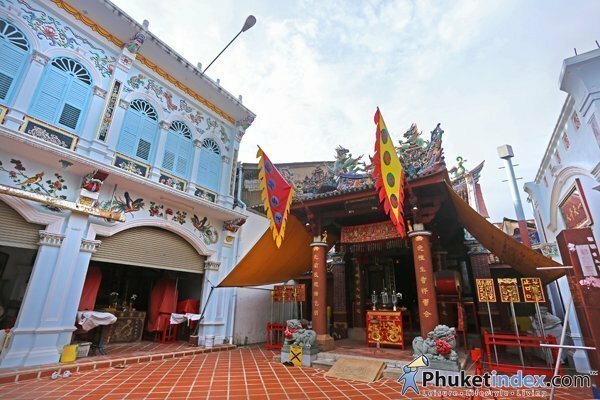 Shrine Sang Tham or ‘Shrine Teng Kong Tong’ is located on Phang-Nga Road in Phuket Town. It’s an ancient shrine of the local Tan family. The shrine is in Chinese style; the roof featuring stucco and dragons and is adorned with images of immortals and embellished ceramics of colourful fl owers and leaves as well as a mosaic pattern. The interior features popular deities such as Kuan Yin (Pud Jor) by Ong Soon Tai. There is also a mural of Si Yin Kui (in a previous existence Ong Soon Tai Sai, an ancestor of the Tan family) and also a portrayal of Chu Sae Nhiew Niew.